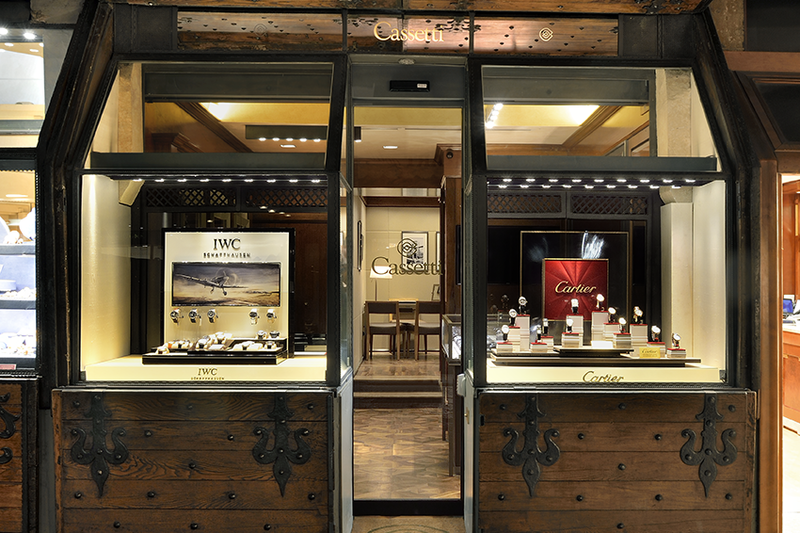 Synthesizing the Boutique is the result of Cassetti’s strategy toghether Cartier and Iwc brands; it is located in the unique place in the world, an excellent combination of elegance and dynamism, but above all courtesy and hospitality. The architectural insertions of the two Richemont’s brands are very particular in perfect harmony with brands concepts; all obviously has been drawn and inserted into the unique context of the ancient, but in limited artisan goldsmith's shop, with surprisingly beautiful looks. We offer the entire watch collection of Cartier, the jeweler king and jeweler of the king, famous for its charm and niceness, as well as the entire collection of IWC Schaffhausen with its masterpieces of Swiss watchmaking, characterized by innovation, technology, precision engineering and exclusive international design. Everything in a rich, well-cared and finished "sitting room" with every detail where there is a highly qualified staff, with sales-person with courses made directly at the hgouse, attention and professionalism, excellent assistance.